QR Codes or SnapTags: What’s Better For Your Brand? A few days ago, I wrote a post about the different tools brands could use for mobile engagement of their audiences. Two of those tools, QR codes and SnapTags, generated a slight buzz, and I thought I’d explore them a bit deeper today. 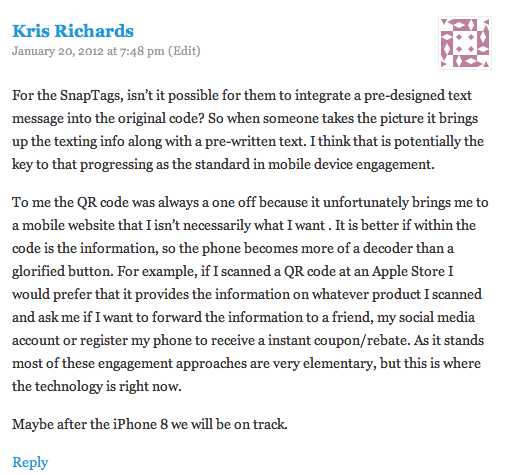 Kris was definitely not checking for QR codes. By now, I’m sure you’ve seen or heard all about QR codes. They’re those strange looking blocks with squiggly lines and boxes inside of them. They’re on magazines, in subways, on business cards, the sides of soda cans, on posters, even in commercials and television programs. If you’ve got a QR code reader on your mobile phone, you can snap a QR code, and unlock a text message, a picture or be navigated to a static web page, video or trigger an mp3. SnapTags are a little more sophisticated than they’re less aesthetic cousin. SnapTags are rings, with visual information aligned in a pattern of bars and breaks, that impacts what content is accessed by a compatible reader app. What makes SnapTags unique is the fact that each tag also has a unique short code, enabling people without smart phones to send and receive text messages which will connect them with the associated campaign. Both QR Codes and SnapTags accomplish essentially the same thing: navigating the user to a particular destination or piece of content. To hear Spyderlynk tell it, SnapTags are better. Better looking. Why have a blurry blog of blocks, when you can promote your complete logo (in a ring)? Easier to use. Unlike QR Codes, which require a QR code reader, SnapTags work with any camera phone that can send and receive texts. Web not required. SnapTags work whether you have an internet connection or not. If you can send and receive a text, you can still take advantage of SnapTags. Comprehensive analytics. Because SnapTags can be triggered in multiple ways, you can generate and track layered analytics. Despite their superior looks, ease of use and utility with or without an internet connection, SnapTags do have their drawbacks. For one, they’re not free. In order to create a SnapTag and utilize it, you’ve got to pay Spyderlynk to set up a campaign for you. Since they don’t publish their prices on their website, we can assume it’s not cheap. QR Codes, on the other hand, are free, and don’t require any elaborate set up to enable. A second shortcoming is the fact that SnapTags are proprietary. You can only create a SnapTag through Spyderlynk, and (presumably) every new campaign requires a new ring. QR Codes aren’t quite ‘open-source’ but there are a number of free QR Code generators, and you can create as many different codes for as many different campaigns as you can dream up. Finally, SnapTags are relatively new and not particularly widespread. While several major campaigns have used SnapTags (Neutrogena, Coors Light, Toyota), there’s no rush on them quite yet. QR Codes have been around for several years, and although they are not the dominant standard, they are very well recognized and heavily used. I, for one, think SnapTags are pretty fresh. The multiple things you can do, the aesthetic appeal, the ability to maximize the full breadth of mobile marketing, truly make it a marketers playground. If you’re thinking about jumping in to mobile marketing, and don’t know whether QR Codes or SnapTags are right for you, try them both out and decide for yourself. If you’ve got any questions, feel free to reach out to me and I’ll see if I can help you decide!